UC San Diego swim and dive defeated Claremont-Mudd-Scripps 148–135 on the men’s side and 175–114 on the women’s side on Saturday, Oct. 28. The No. 7-ranked Tritons won their first meet under the new head coach, David Marsh, who also served as head coach for the 2016 U.S. Women’s Olympic Team. In 20 out of the total 32 swim and dive events, UCSD placed first. Among the list of notable Tritons were freshman sprint freestyle Ciara Franke, senior individual medley/butterfly Kevin Fink, sophomore sprint freestyle Sawyer Farmer, and freshman backstroke/freestyle/butterfly Tenny Chong. All four of these individuals placed first in multiple events. Farmer and Franke dominated the 50- and 100-yard freestyles for the men’s side and women’s side, respectively. Fink won the 200-yard fly and 500-yard free. Tenny finished first for the 100-yard and 200-yard back, but was also part of the team that swept the 200-yard IM. For diving, junior Brooke Abrantes garnered scores of 241.87 in the Women’s 3-meter and 249.75 in the Women’s 1-meter to take first in both events. Some other winners of the day were sophomore distance freestyle Kaitlyn Ritchey (1000 free, 10:27.45), junior distance freestyle Alejandro Ortiz (1000 free, 9:50.13), sophomore middle distance freestyle Alayna Gocke (200 free, 1:53.82), senior sprint/middle distance freestyle Samuel Lee (200 free, 1:44.24), senior sprint freestyle/breastroke Angie Phetbenjakul (100 breast, 1:05.64), and freshman butterfly/backstroke Lindsay Clark (200 fly, 2:09.12). 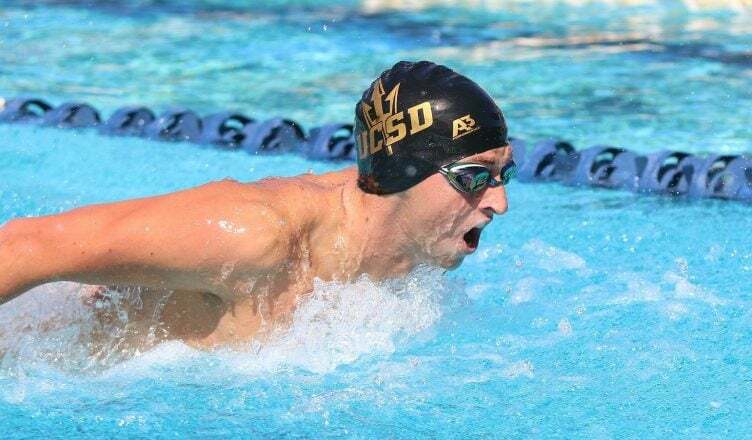 UCSD will swim against UC Santa Barbara on Nov. 4 at 11 p.m. This event will be a swim-only event and will take place in Santa Barbara.